It seems there are are two publishers for this book. Peachpit Press published one titled Best Digital Brushes for Photoshop: A unique directory of over 4,000 digital brush effects, and how to achieve them with the cover you see on the left. The other's from RotoVision showing the cover above. Peachpit Press is the USA publisher and RotoVision is the UK publisher. Both are 416 pages and the author Susannah Hall is the same. The book covers Photoshop CS5 so some new features would not be found in previous versions of Photoshop. 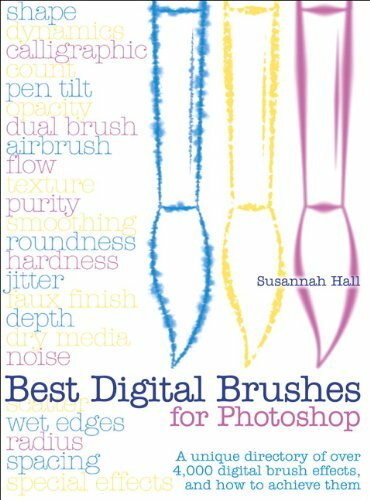 It starts off with a brush primer showing what they are capable of with artist examples and then there's the useful section of creating your own Photoshop brushes with brush settings. Next up is the brush directory with over 300 pages featuring 4000 brush selections. This is an incredibly convenient source of custom Photoshop brushes. It's so quick to browse through the pages and pick a brush than to manually creating one by trial and error. There are no tutorials but based on the first chapter, you'll have no problem finding out where to tweak the brushes. Each brush featured has their brush stroke shown. The main default brush is picked, and the other brushes modified with different customised settings. All the customised settings are shown. Selected ones have examples of how backgrounds would look when filled with the brush stroke. At the back of the book are additional content on how to use layers, blending modes and adjustment layers. Those are just bonus material, nice to have but not totally related to the brushes. This is a fantastic resource. A time saver. Peachpit Press is a US publisher and RotoVision is a UK publisher. Hence the difference. Thanks. I've updated the review with the information.